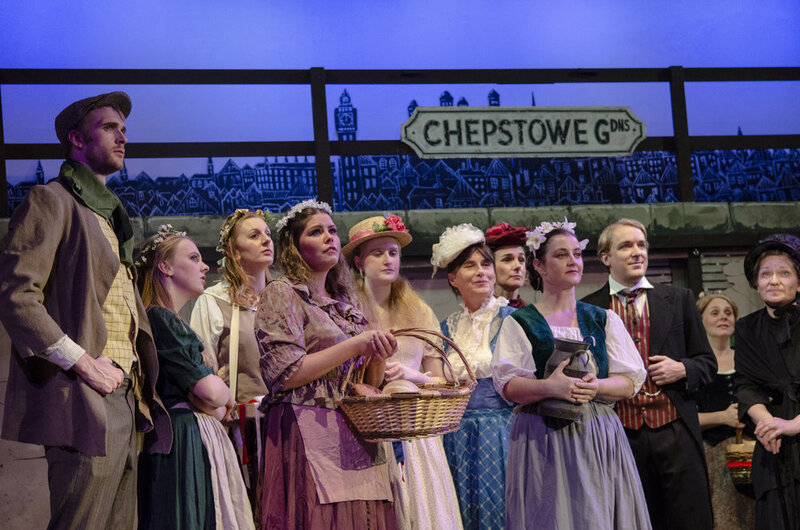 SWMTC's award-winning Youth Group and Adult Company joined together to bring Lionel Bart's much-loved classic musical masterpiece to Saffron Walden Town Hall. Filled with belting songs such as 'Food, Glorious Food', ' Consider Yourself', 'You've Got To Pick a Pocket Or Two' and 'As Long As He Needs Me', it was a show that had everyone 'Reviewing The Situation' and calling for MORE! 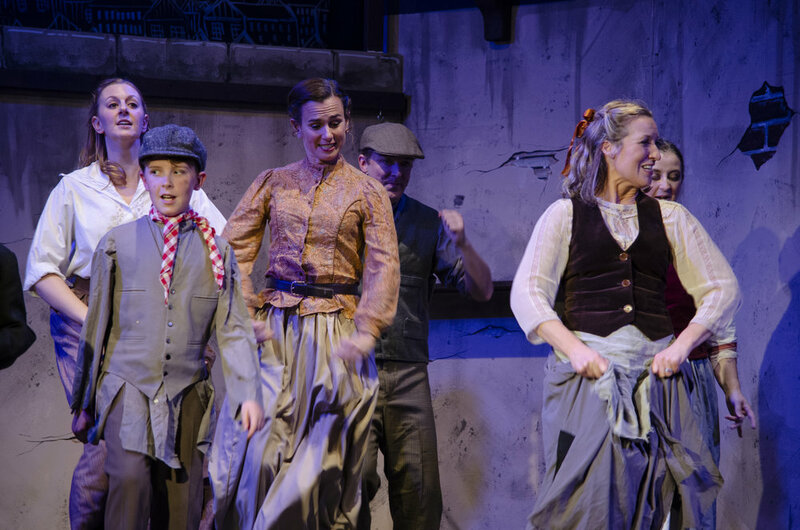 Lionel Bart’s musical based on Charles Dickens’ Oliver Twist needs no introduction. It has definitely stood the test of time and is still a great favourite with musical societies, especially those wanting to combine the talents of their adult and youth groups, as was the case here. The popularity of the show and the society meant that it sold out before the curtain had even risen on the first performance. A good opening scene with the children entering, carrying their food bowls and singing the opening number, “Food Glorious Food”. The use of flower pot saucers was an idea I had not seen before but it seemed to work. I can’t imagine though that they would have been expected to eat gruel without the aid of a spoon. 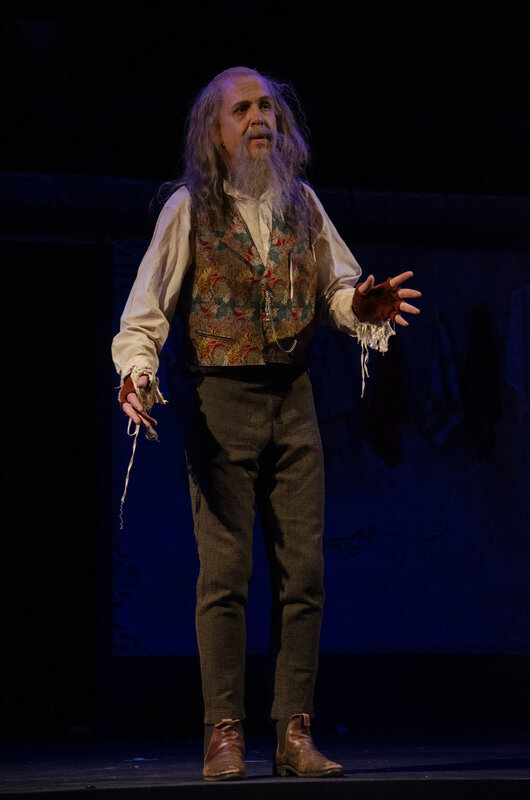 William Hillier was Oliver at this matinee performance and played the role well. His solo “Where is Love” was nicely sung. Rufus Goatman made a good Dodger, confident acting and singing with just the right amount of cheekiness. One to watch. Jason Austin-Guest made an excellent Mr Bumble and his pairing with Alison Hare as Widow Corney worked well. Will Taylor was suitably sombre as Mr Sowerberry with the excitable Mrs Sowerberry well played by Louise Constable-Maxwell. The character of Nancy maintains a hard exterior which just occasionally slips, displaying a certain amount of naivety. I think Gemma Alexander got the balance just right. A very creditable performance. Her loyal friend Bet was nicely played by Errin Baker and Steve Waring was suitably scary as Bill. Toby Kerrison and Zoe Kambitsis were well cast as Noah and Charlotte and a nice performance by Jane Chate as the kindly Mrs Bedwin. 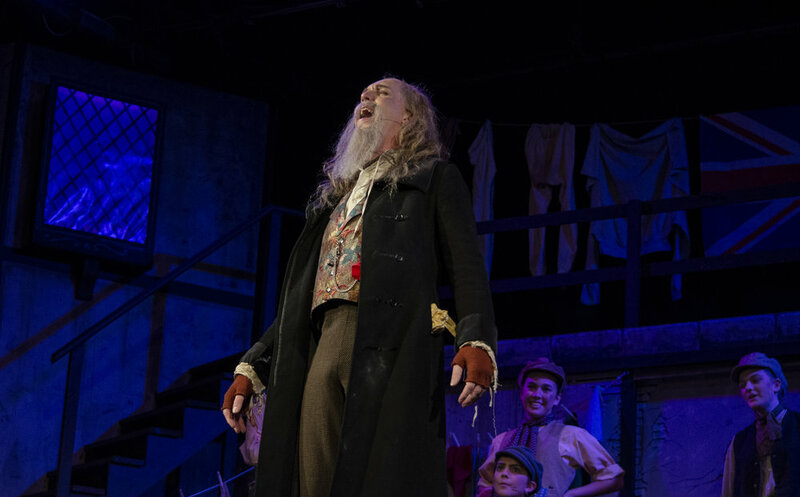 Matthew Chancellor made a good Fagin although in this production the character appeared cleaner and better dressed than usual. 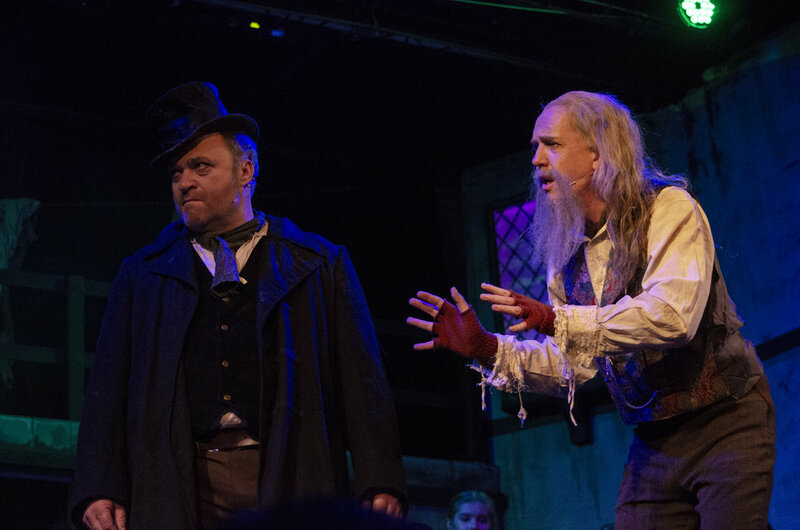 David Smithet was well cast as Mr Brownlow and David Pearl as Dr Grimwig. The “Who will Buy” scene was very well sung with some lovely harmonies. The set was well thought out and used imaginatively and I liked that Fagin hid his treasure inside a step. It was a shame that when it was used as Brownlow’s house it did look very bare, with only the rather awkwardly placed picture of Agnes on the mantelpiece. The orchestra, under the direction of Paul Garner provided excellent accompaniment throughout and lighting and sound were all good. 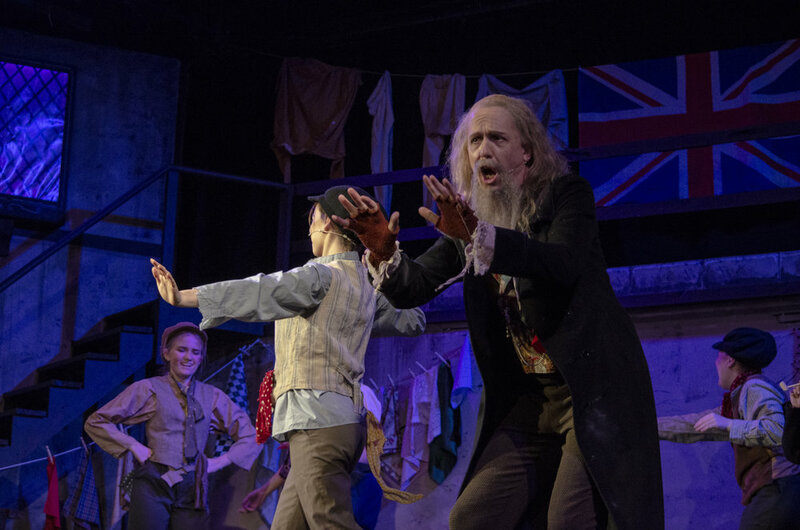 Oliver is a fun show to perform and for the most part this production worked well. If I have been picky it’s only because I have become used to seeing the society perform to a very high standard with meticulous attention to detail. Nevertheless it was very entertaining and Fiona Wilson Waterworth should be pleased with her first foray into directing.